An odd article entitled “Liquor wins quality medal for preserving national smack” emerged recently, published by the Democratic People’s Republic of (North) Korea’s (DPRK’s) Pyongyang Times. In it, claims are made that a North Korean insam (ginseng) liquor can be drunk without fear of hangover. In other words, if the article is to believed (and Huffington Post, NK News, BBC, The Guardian, CNN and other media outlets are all over this), The North Koreans have invented HANGOVER-FREE ALCOHOL! The manufacturers, Taedonggang Foodstuff Factory, have apparently been developing and improving the drink over the course of many years. Their final creation, called Koryo Liquor is “made of six-year-old Kaesong Koryo insam, known as being highest in medicinal effect, and the scorched rice, is highly appreciated by experts and lovers as it is suave and causes no hangover,” according to the article. The liquor purportedly has an alcoholic content of between 30 to 40 percent (!!). Regular beer, of the type you might buy at your local corner store, has an alcoholic content of 3-10% and most wines anywhere from 8-14% (spirits can vary greatly depending on type; anywhere from 20-70%). Hangover Free Beer / Liquor – Is It Too Good To Be True? As we’re massive science fans over at Sobur HQ, we were super excited to deep dive into this supposed hangover-free beer and look into the research behind it upon first hearing whispers about the elixir. But the wording of the Pyongyang Times article about the elixir gave us immediate pause, it is just a little bit too full of pro-DPRK propaganda to be believable as a credible starting point for research. But I’ve read my fair share of press releases for alcohol brand announcements and other industry news to filter out/ignore sentences like ”The product exudes national flavor also in the shape of bottle and packaging“ and ”the liquor has already been registered as a national scientific and technological hit“ — so let me attempt to break down how the hangover-free alcoholic drink actually works. But how does this hangover-free alcoholic elixir work? 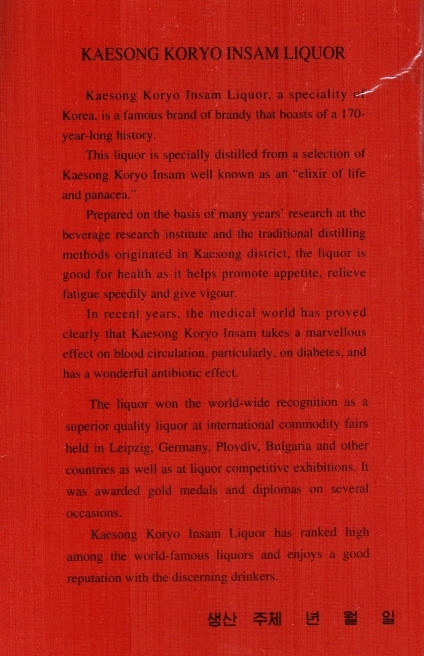 Well, from what research we’ve been able to perform, the main ingredient in Koryo liquor is Ginseng, a perennial plant with fleshy roots that is commonly used in both North & South Korea on account of its medicinal properties, and the Kaesong area in the DPRK is famous for the product. The specific type of ‘insam’ (meaning ginseng) used here is Kaesong Koryo insam, which apparently ”boasts of a 170 year history“ and is said to wield a myriad of medicinal benefits, ranging from beating physical and mental fatigue all the way to curing diabetes. North Korea recently released a wonder drug named Kumdang-2 containing ginseng (and not a lot else) that apparently cures Ebola, AIDS, MERS, tuberculosis and well…cancer. It would seem that many North Koreans place a lot of faith in the plant. Sugar, in this elixir, is then replaced with scorched, glutinous rice and this process removes the bitterness from the insam (ginseng) and, crucially, the hangover. Whether ginseng, by itself or combined with glutinous rice, is an effective hangover cure is a subject matter that’s up for debate. Ginseng is touted as a viable alternative to coffee as a pleasant morning-after energy booster, particularly as caffeine is a diuretic and so doesn’t exactly help with the re-hydrating process needed to sober up after consuming large quantities of alcohol. Ginseng has also been known to cause nausea, headaches and high blood pressure as ‘side-effects’ if consumed in too large an amount, which can be really bad in combination with a hangover! Where Can I Buy This North Korean Hangover Free Alcohol? Not as hard to do as it was say, 4-5 years ago, visiting one of the most isolated countries on earth (it’s called the Hermit Kingdom for a reason) is the easiest fastest craziest way to get your hands on some Koryo liquor. Most tourists only experience the political smokescreen of Pyongyang, where the liquor is actually available in ‘supermarkets’. Be advised though that its illegal for foreigners to handle local DPRK currency. To pay, you have to line up; receive a receipt, then pay at a currency exchange booth offering unofficial, artificially inflated North Korean Won rates — head back to collect your goods and finally back to the booth to collect change in 3 different currencies. You’ll also likely be thoroughly searched upon exit of North Korea at Sinuiju. I don’t envy you if you decide to go this route! An easier and more secure way to visit the DPRK might be to book a tour or organised group trip through a specialized company like young pioneer tours, Koryo group or New Korea Tours. Always good for obscure products that are readily available in the Asia-Pacific region, Korean Ginseng tea and likely liquor are readily available on Alibaba if you’re willing to search through the listings and do a little bit of back-and-forth communication with the sellers. Although more likely to happen due to a rise in demand for the taste of ginseng liquor (those crazy hipsters) than it is for the ‘magic’ alleged benefits of ginseng in liquid form, remaining patient and pestering your local shop keeper to see if they have ‘started selling Koryo liquor yet’ is 100% the laziest way to maybe try some out… one day. Koryo liquor is available to buy online in several places, although we do not vouch for any retailer and you purchase at your own-risk. One such retailer we found is Benje Trading LTD, and here’s their Facebook page.